[Substance Editor's Note: The following statement was delivered at the February 26, 2014 meeting of the Chicago Board of Educatoin by Cassie Crestwell of More Than A Score. The members of the Board of Education sat stonily and did not ask any questions after the presentation was completed, although earlier they had attempted to ask questions to support charter schools even in the face of growing evidence that charters discriminate and lie about their data...]. 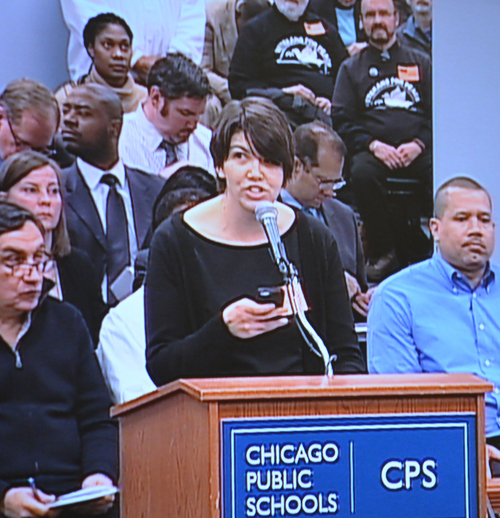 Cassie Creswell of More than a Score presenting to the February 24, 2014 meeting of the Chicago Board of Education. Substance photo by George N. Schmidt.The following was presented by More Than a Score at the CPS Board meeting held on February 26, 2014. �Hundreds of parents and students at more than 40 schools and, now, scores of brave teachers at Saucedo Academy are demanding the return of precious hours of authentic learning instead of the administration of yet another standardized test this year�the ISAT. "The ISAT is costing the state of Illinois $18 million to administer, $3.5 of that for CPS. "Four days of instruction were added as makeup days to the calendar because of inclement weather; yet now two weeks will be spent on the ISAT, a test that has no administrative or instructional purpose. "But two years ago, they claimed that the NWEA MAP test was chosen specifically to be the district-wide assessment because its proposal scored the highest in terms of Common Core Alignment. In addition, the Office of Assessment newly requires Common Core Quarterly Benchmarks in ELA and math administered to 3-8th (and other) grades. "Meanwhile, having claimed to have eliminated 15 standardized tests and reduced the number of tests to 10 this year, in fact, most third through eighth graders in this district are being subjected to anywhere from 13 to 25 standardized tests. "More Than a Score call on you the Board of Education to stop misinformation�info in direct contradiction with what CEO Barbara Byrd Bennett has written�from being spread in this district by network chiefs and principals. "We call on you to start providing parents and students with clear, accurate information about the reason this test is being given, federal and state law, and what the results are being used for, measuring Adequate Yearly Progress, a measure that most schools already fail to meet and that by itself has no automatic consequences in this district. "You the BOE may be required by law to administer this test, but students are not required to take it. We call on you and the CEO to tell principals at all schools to stand down from coercion and intimidation and respectfully allow parents to exercise their rights to direct their children�s education.